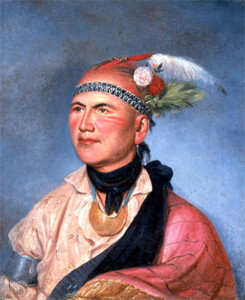 Called Thayendanegea by the Mohawks, Brant was educated at Moor’s Charity School for Indians in Lebanon, Connecticut, and converted to the Anglican church. Well versed in the English language and in history, he became an interpreter for an Anglican missionary and coauthored a Mohawk translation of The Book of Common Prayer and the Gospel of Mark. Believing that American independence would result in the usurpation of all Indian land, Brant fought on the side of the British during the American Revolution, visiting terror upon the New York frontier. After the war, however, he become an advocate for peace between whites and Indians and settled on a land grant in Canada.